With funding from BCC, Secret City Arts will be nesting on The Arts Bus for five dates over the next few months. Also check out our related bird inspired pages with links and ideas of how you can get involved or create your own bird inspired craft projects. What are birds’ landmarks in your neighbourhood? Do birds listen to our music and noise, as we listen to their calls? What do birds’ songs say? What do birds dream about? So much inspiration! So little time! We spent a week with children at the Wildside Activity Centre in Wolverhampton exploring the Lost Village of Aldersley – once a bustling canal junction with a hotel and tollhouse, now a quiet backwater. On our project page Lost Village of Aldersley you can read our poems, see the wonderful story animation the children made with Claire, and find out more about drama work with Pyn. Through the portal leaping back into the past. Road back to muddy track. There were many wonderful reminscences, responses and stories exploring the walls and water of Brindley Place and the canals. Here are just a couple to give you an idea. More will appear as time goes on and some are being transcribed in readiness for the booklet. I am currently working with music producer Marc Reck to create a collage of voices and sound from the collected recordings as further interpretation of the project. Click here to see the film we made in Brindleyplace. It’s based on the environment there, the buildings and canals, and inspired by the animations of Len Lye, whose work was being shown at Ikon gallery. 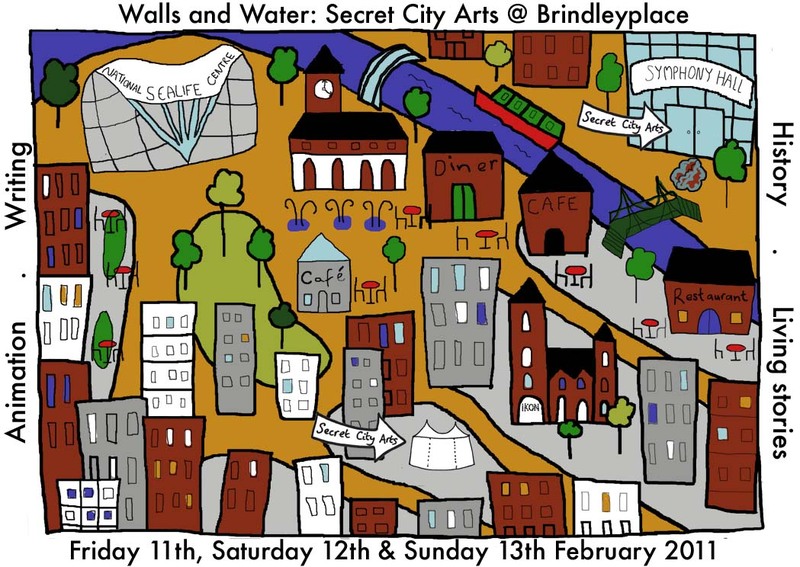 Walls and Water was a huge success – over three hundred people came and took part, contributing to a collective animation and recording their stories, memories, and responses to the canals and the built environment in Brindleyplace. Lots of people contributed to a couple of collective poems, Still Water, Still Here and Highways past and present. Come and join Secret City Arts in Brindleyplace in Birmingham City Centre to take another look at the environment there in the past, present (and future…) and create written and oral work and animation in response to it. We’ll be at two venues, one parked in a marquee outside the Ikon and the other snug inside Symphony Hall foyer on Friday 11th (1-6pm), Saturday 12th (11am-4pm) and Sunday 13th Feb (11am-4pm). Come and write poetry, record your thoughts and stories and make animated films (based on the work of animation legend Len Lye showing at the Ikon). Welcome to Secret City Arts !